The MUNFIX fancy toast champagne flute is perfect for catered events, parties, bars, nightclubs or any other event where you require an economical alternative to permanent glassware. This disposable cocktail glasses are made of durable clear hard plastic. The Munfix Clear Plastic Flute are Elegant and practical, Premium Plastic Disposable Cups a must-have for the frequent party hostess! use it for wine cups, champagne cups, mimosa cups, or water cup. ideal for bridal shower, bachelorette engagement parties, weddings, sophisticated events and New Year's Eve parties. 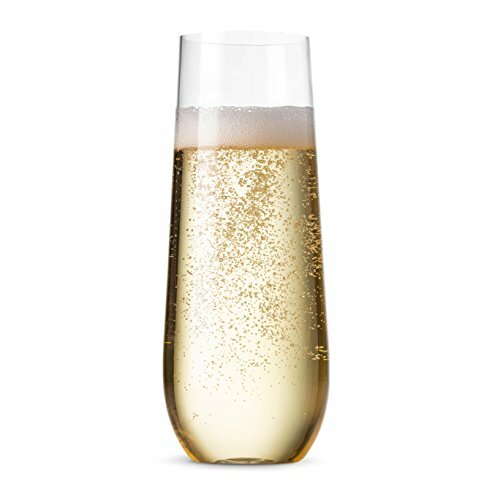 9oz Shatterproof Wedding champagne flutes Made of durable premium hard recyclable plastic, BPA-Free, Not dishwasher safe!. If you have any questions about this product by Munfix, contact us by completing and submitting the form below. If you are looking for a specif part number, please include it with your message.